Err… so this is actually “What I’ve Eaten Lately” because I haven’t been very good at updating or taking pictures of the yummy food I eat. 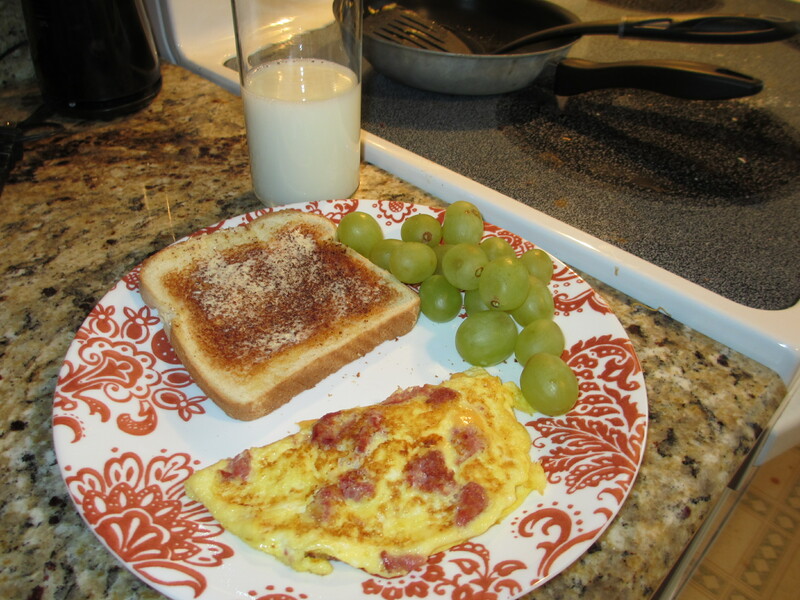 This delicious meal was breakfast on 1/15/12 – told you it had been a long time since I updated! I love my weekends – I always try to make at least one yummy breakfast like this one. This is a 2 egg omelet with Ekrich Smoky Links and American Cheese. I had some green grapes on the side, a slice of white toast with I Can’t Believe It’s Not Butter! and a nice glass of skim milk. 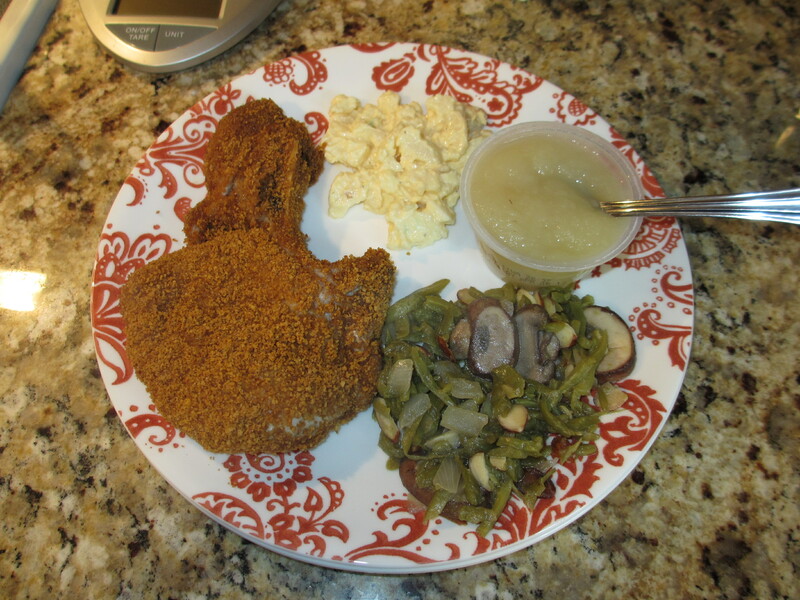 A week later, we enjoyed some pork chops and applesauce! This was dinner on the day of the AFC and NFC championships (for those who don’t know what I’m talking about… football, that’s all you need to know!). I sauteed some green beans with onions, mushrooms and almonds. We got some of our favorite potato salad from the Kroger deli, and I had mine with Mott’s Natural Applesauce! Ken did a great job “shake ‘n bake”-ing the pork chops for us. This is a great example of one of my “go-to” meals when I don’t feel like thinking and I don’t feel like following a recipe. I always have frozen chicken strips (both regular and BBQ), frozen vegetables of all kinds, and frozen french fries (either regular or sweet potato) on hand. They cook up quickly for a nice balanced meal! 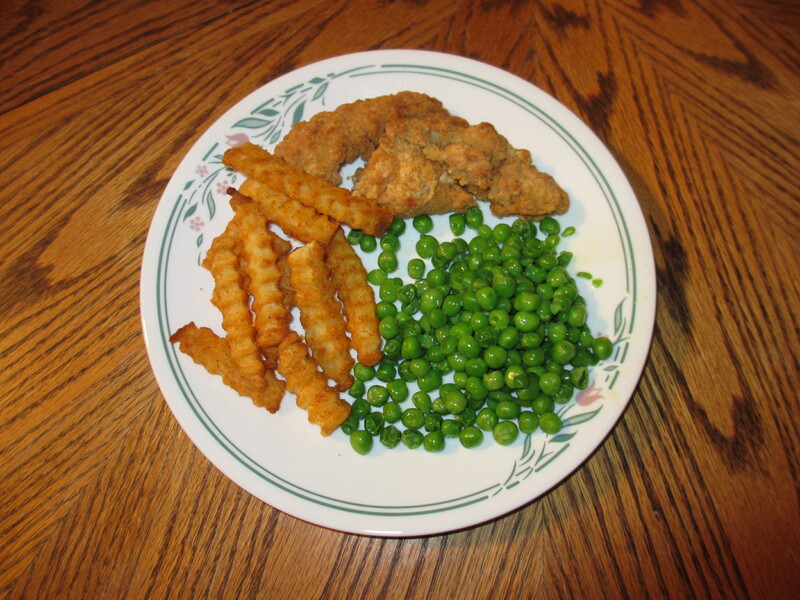 The chicken and the fries are a bit high in sodium, but frozen vegetables are typically very low in sodium. Sometimes I’ll whip up some pasta for a side instead, or I’ll just have some chicken as a snack. I did actually get a picture of what I had for breakfast today! I made regular oatmeal and added a tablespoon of natural peanut butter, a tablespoon of brown sugar, and close to a teaspoon of cinnamon. No matter what I do, my oatmeal always explodes in the microwave – you can see the evidence on the bowl! 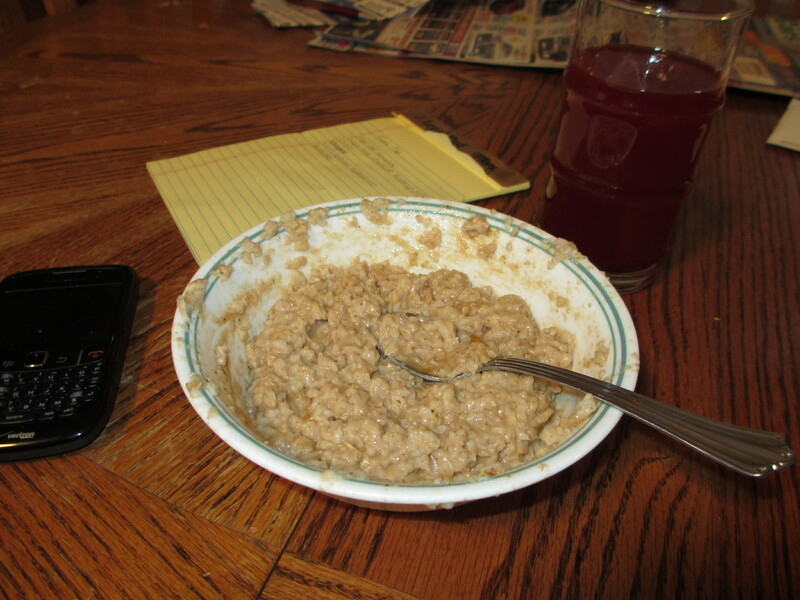 I paired my yummy oatmeal with a glass of V8 Fusion Concord Grape Raspberry, YUM!!! I love the taste of grape juice, and this juice gets an extra bang for you buck – each 8 ounce glass has a serving of fruit and a serving of vegetables! You can’t taste anything but yummy grapes. 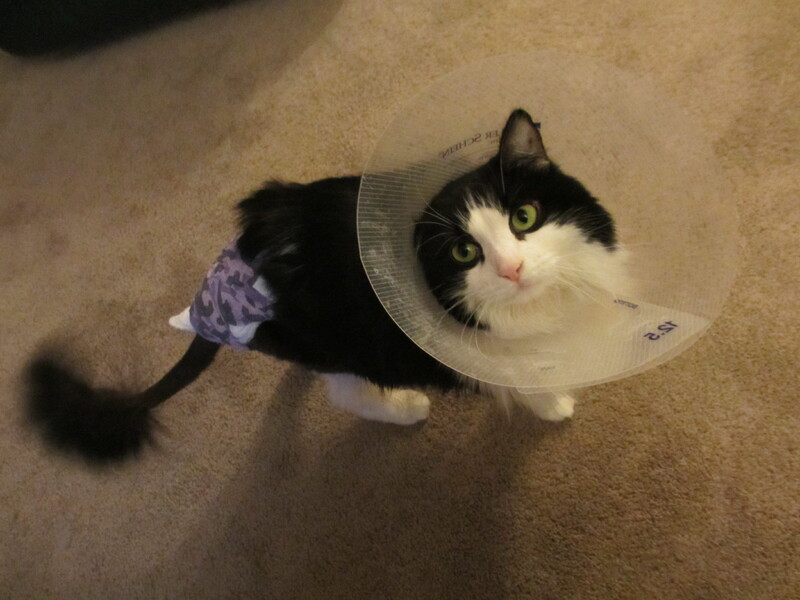 Lastly I will leave you with two things… one – a picture of my cat, since she seems to be starring in my blog lately. She’s doing a lot better, they no longer have us coming in daily to change her bandage, we just have her in onesies at home now. It’s really cute, except she knows how to get herself out of them so we have to keep an eye on her. Keeping It Real: Where Did I Go? Keeping It Real: Remember Me? awwww so glad she’s doing better!!! look at that face! so cute! and i’m a sucker for Mr. Pollan =) He was the inspiration behind my “You are what you Eat. Eat pretty!” mantra <3 happy wiaw! Love that quote! Oatmeal looks so good.